Going outdoors, whether for a jog, walk or hiking may be just for relaxation and refreshment purposes, but many people don’t consider the fact that being outdoors may not be as safe as they may think, even in the nearby park. This is especially true when going hiking. Animals in the nature are usually shy and avoid humans (also they stay away from established trails), but nonetheless, they may feel endangered. When an animal feels threatened it attacks as a self-defense. 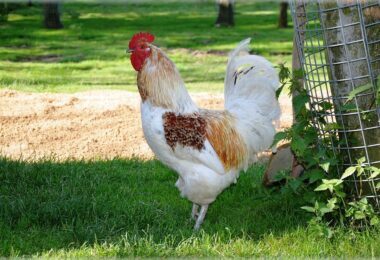 Intentionally or not, if an animal feels provoked you must be ready to defend yourself. There are several very good methods of defending yourself without permanently harming the attacker. 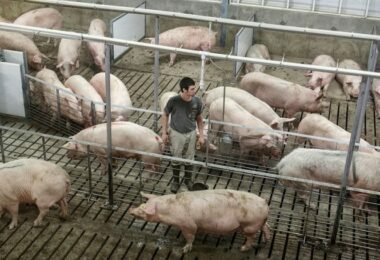 Most of them are popular among joggers since not only animals may be a threat, but also humans. We’ll give you an extensive list of popular and reliable products, as well as a bit more insight into their use and context of the situation. We’ll begin this list with the most efficient item and that is the pepper spray (oleoresin capsicum). It’s widely used among pedestrians and regular joggers. The uppermost limit is 15% Capsicum. This means this is the highest possible concentration of the solution inside which the law can allow you to carry. So basically, the oleoresin capsicum is an extract from the hottest chili that ever exists in the world. The spray works by combing the extract with an emollient. In this way a spray or gel is generated. It’s also used by police officers. For different countries different limits may exist, so check the laws before you decide to travel international. 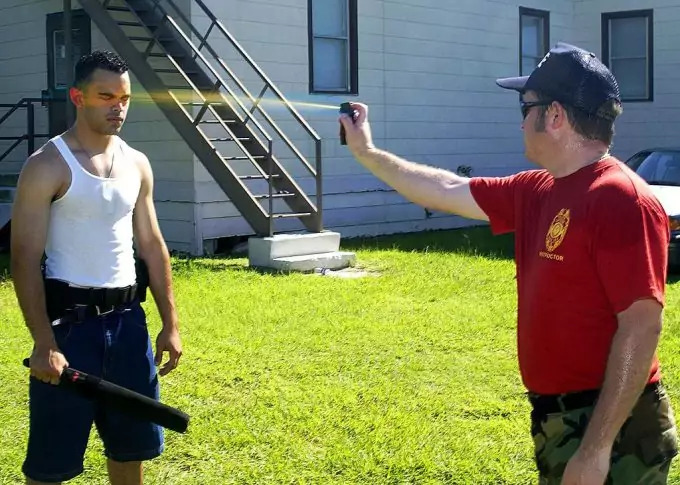 The effect of the pepper spray is that it causes immediate irritation of the eyes, nose and can impair breathing, leading to coughing and sneezing. It lasts to about 30-40 minutes. Within that time you can be at a safe distance far away from the threatening individual or animal. You should check out our article on how to use pepper spray to make sure you don’t get caught in your own actions. 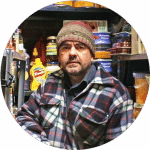 There are special dog or bear sprays, based again on pepper and chili solutions. When you encounter a wild animal try to remain calm. Running is the worst thing you can do unless the animal is running towards you. As we said, animals are as afraid of humans as we of them, so if you just slowly retreat (without showing your back to the animal) you may avoid using the spray. Use it only in case you are attacked face on. There are many tricks to fool a wolf or a bear, but you need to educate yourself a bit about their instincts and what drives them to attack prey. To add to the spray list, you can also consider the hornet and wasp sprays. They are also very effective in case of a large predator, and of course against attacking insects. There are many products, like Raid Wasp & hornet killer, Ortho hornet & wasp killer, Spectracide spray, Digrain insectaclear, etc. 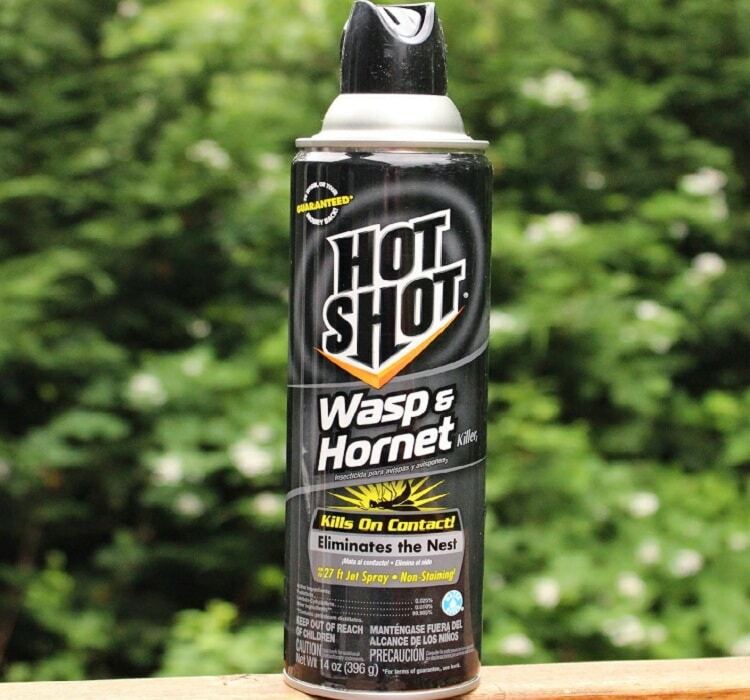 You can also prepare your own wasp and hornet spray at home. You can find formulas on how to make your own product. You need to know though, that killing just a few wasps won’t be helpful if the nest is nearby. Usually endangered wasps send signals to other wasps that are close-by, and the latter may get angry and attack you. So that may further complicate your situation. So aim at their nest; that should be your only target. Some sprays may not be able to kill the nest, but others are. So find products of the latter group. This should be stated explicitly on the product’s label. When it comes to pepper sprays you can use on a human attacker, we have an interesting article containing the reviews for the best products on the market that you should check out. Another option for self-defense without long-lasting harm for the attacker is the stun-gun. It is a very convenient defense weapon, which is small and can fit into your palm or pocket and be used immediately, provided you have time to react. Some are very small, from cell phone to pager sizes. There are several types of stun guns, like disguised, flashlight stun guns and stun batons. 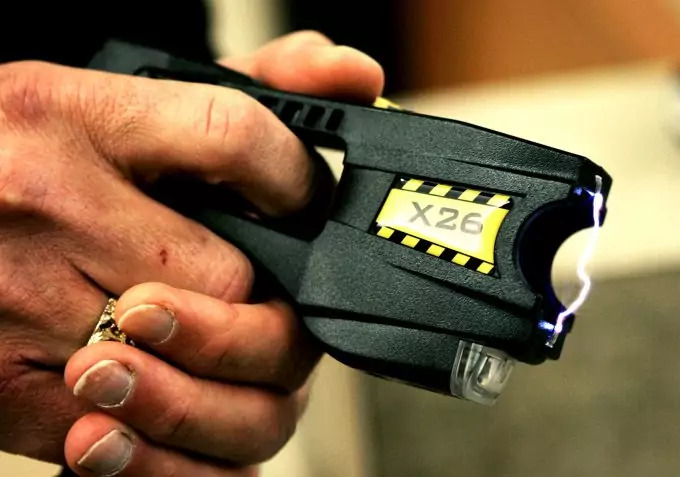 The difference between the stun guns and the Taser is that the former shoot lower voltage through the attacker and just shocks them for a while. The Tasers have a much more lasting effects. 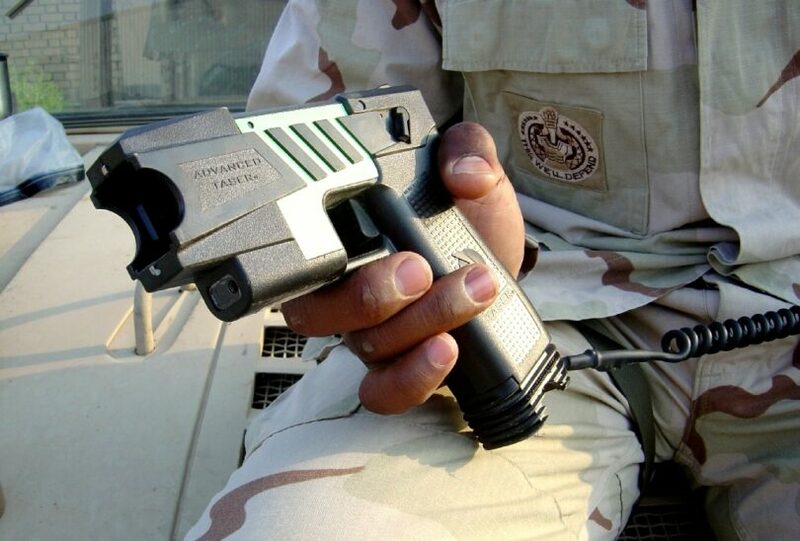 Another useful technology is the Taser C2. It sends enough voltage (several million volts at best) to immobilize the attacker. Its lightweight and the size of a remote control. It shoots out barbs that attach to the attacker’s skin and sends electricity that incapacitates the individual or animal. The only drawback is that it works once, per person, and if more than 2 attackers surround you, you may be in trouble. We have a great set of in-depth reviews for the best stun gun you can use in case of an attack, to help you decide on the type of device you need. In such situations a spray would be a better option since you can act instantly and spray each and every one that approaches you. Otherwise, you can pack as many Taser cartridges as you can possibly carry. Of course, if you’re out there jogging or hiking in the back country, carrying too much load may be counter-intuitive. So, be aware of where you’ll be going and consider the pros and cons, and if a Taser is worth it. 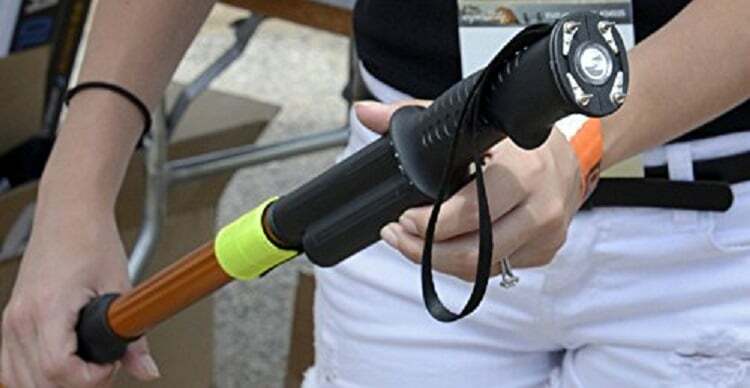 There are also some very popular walking sticks whose end has a stun gun, shooting millions of voltages to the attacker. These can be used both by hikers and by casual pedestrians. It’s very comfortable and can fool anyone, especially individuals who think you’re weak enough to support yourself with a walking stick, until you stun them down. Some such sticks are specifically made with regards to hikers; others are made for casual citizens. There is a very popular hiker’s staff, called Hike ‘n Strike. It has not only the possibility of shooting millions of volts, but also has an in-built flashlight at the end. It is expandable, and can be perfectly used as a walking stick during hikes. Its handle is made of rubber-coated grip to prevent it from slipping your hand. Usually manufacturers advise against intentionally facing larger, more aggressive animals, since there’s no knowing how the animal would react to this high voltage. Larger animals may not be stunned as hard as smaller ones, so you may even anger it more. Again, the best advice is to avoid the animal as best you can and use the weapons you have just as a last resort. When it comes to hiking, during the winter, it is very convenient to carry along an ice axe. It’s not only useful if you need it in icy areas, slippery rocks and so on, but also as a defense tool. You have to be careful with it though, since it is easy to kill with it, and you should avoid this as much as you can, unless your life is at stake. If you’re attacked straight on by a wild predator use the ice axe at least to wound the animal. If there are more attackers you may not have the time to think of wounding. Self-defense in such a situation is your top priority. 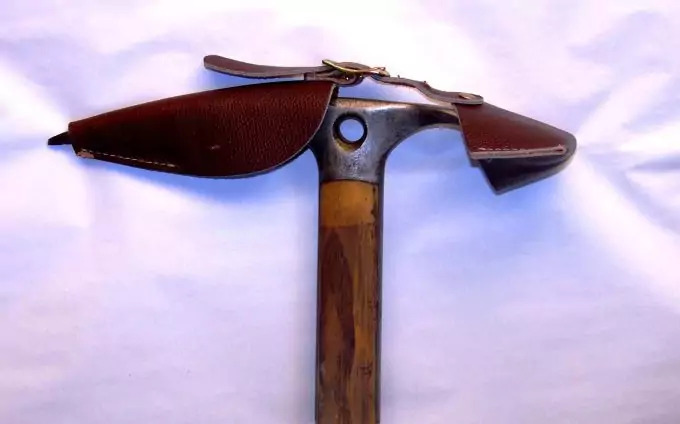 While on the topic of steel weapons, there is a certain new product on the market called Zubinaxe. It’s a stick with removable head, on which you can attach different weapons like saw, axe, spear, sling shot, etc. It’s very handy, compact and can serve multiple purposes – from basic survival and hunting and finally to defending yourself. You can use light also as a defense tool. It may not be as reliable and long lasting, but if you lack defense tools, light can also be a savior. You can use it both in daylight and during the night. In daytime, use a mirror or an item with metal surface to reflect light from it. Point the light towards the attacker to blind them temporarily. Until they come to their senses you will have some time to run. During the night, use your flashlight in the same way. Always point the light straight in the attacker’s face. If you have matches and lighter (and some alcohol or vaseline) make a flamethrower. Vaseline catches fire easily so if you don’t have alcohol use the vaseline. There are special flashlights, called tactical flashlights. They emit a much stronger point light that disorients the attacker. It is true that most tactical flashlights are designed for military use, but lately many more of these tactical flashlights find their way among casual citizens or hikers. Most of these items are made of durable material, like aluminum or steel to keep it light and not break as easily as an ordinary pocket flashlight. So, in order to consider a tactical flashlight ideal for your purposes you need to look for the following things – it should be at least 120 lumens, this is strong enough to blind for 3-4 seconds the attacker; it should be light and small, so it can comfortably fit your palm; it also needs to be waterproof, even if it doesn’t make sense to you now, you want to rely on it in any conditions; and ideally it should be LED, since LEDs break rarely, while incandescent light bulbs are much more fragile. Also LED are more durable and don’t run out of power as quickly as the incandescent bulbs. Some good products on the web are Surefire P2X Fury Dual Output LED, Streamlight 88031 Protac Tactical flashlight 2L and NiteCore Extreme LED Flashlight. Of course you may be able to find even better versions, but these are a good starting point. Here you can read about the best tactical flashlight and their reviews in case you decide to go with this. There are some combinations of a flashlight with a toothed bezel (read below) and have Taser ends on the bezel, so you can stun and immobilize your attacker immediately. A sample scenario – you flash the light at their face, the attacker is disoriented for a few seconds, by that time you reach them and hit them on the head with the bezel end and/or Taser them at the same time. This would be the ideal case, so you don’t have to fight. You only need to flee as quickly as you can, since you’ll have a head start. A good such tactical flashlight is for example Guard Dog special ops. It offers 360 lumens of light strength and shoots 8 million volts. It has a light aluminum body. Pocket knives are also popular tools among hikers. 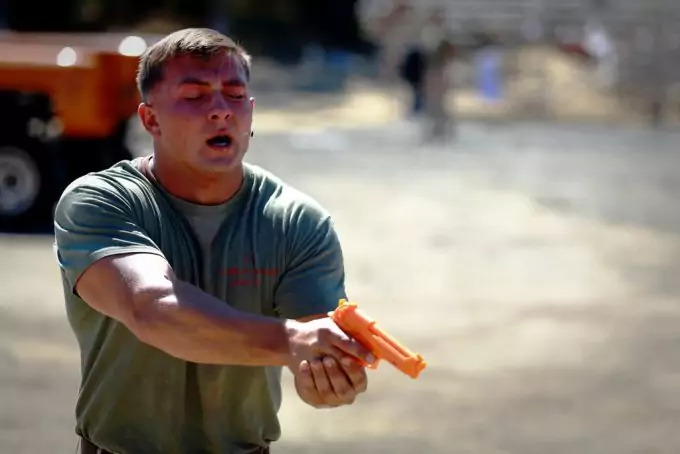 It may be a much more primitive and aggressive tool, and used only in close range, but as long as you keep it a habit, you’ll know you can rely on it. Practice at home to draw it quickly. Decide what’s the best place to keep it – on your belt, on the side of your pants, etc. Also, read our reviews for the best pocket knives and their features. Firearms are usually prohibited in National Parks and National Forests. If you plan on going on an international trip or hike, prepare yourself by first reading the laws of the country or countries you’ll be trekking through. If a country allows small firearm or specific stunning tools of that sort, you can safely pack them. There are many products out there that can serve as self-defense tools, but there are some crucial points to be mentioned. One very important such thing is that many people are unaware of how to use the defense items them had bought – from sprays to knives. Before you go hiking or jogging, consider reading the manual or instructions that accompany the product itself. It is also highly advisable to practice at home alone or with a dummy target. You need to know that if you go hiking in North America many bears are already accustomed to bear sprays and had learned to turn their heads as they see you spraying at them. So before you run out of your precious spray try to aim exactly at the facial area, ideally at the eyes. Don’t spray it all out, but in small amounts, so you don’t run out of the contents quickly. If it finishes though, play dead, lay on the ground with your stomach down (to protect your vital organs) and cover your neck with your hands. Bears rarely attack humans (with the purpose of eating them), and if it considers you dead it will walk away. It may try to turn you around, so don’t struggle. Nonetheless, try to push your weight down. The bear won’t be interested in you if it considers you dead. You need to know also the psychology of the most often encountered animals in national parks. Some like wild cats and mountain lions may be straightaway deadly, although if you look frightening by waving your walking stick, talking loud, making yourself bigger, you may discourage a wild cat or a lion to attack you. 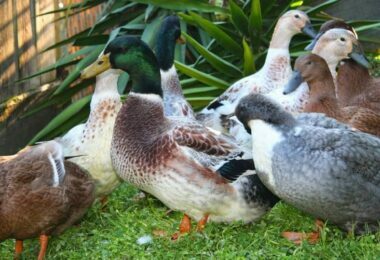 They have low endurance so they may decide that fighting you is not worth the energy. Other animals like wolves may be scared off if you know how to do it. Usually a lone wolf would rarely attack you, but a pack would be hard to scare off. There are many techniques, so you need to be prepared. You also need to know that you have to keep your preferred weapon(s) close at hand. Preferably it should not take more than a second for you to grab your weapon. Sometimes you have to be like a flash and react within the blink of an eye. Many people report how dogs or wolves attacked them from behind. So in such cases you have to be as quick and flexible as possible. Hence our advice to practice before you actually encounter a threatening wild animal. Also, we advise you not to rely on only one defense product. Sometimes some are defective or broken, or just stuck. 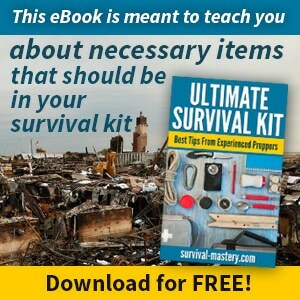 Be prepared with at least one more item. That is why carrying a knife is actually almost always the best you can do. By all means, bring along some other tool, but never leave the knife at home. You should always keep in mind that having a back-up (plan, gear, tool, clothes) is the smartest thing a hiker can do. When it comes to the tactical flashlight, we have to point out, that some versions have a toothed bezel at the end. It is a very handy way to stun your attacker by hitting them hard with the bezel. You must know of course where you’re aiming at and be sure that the hit will definitely do the trick. To round off this list of products and tips and advice from us, we have to say that constant vigilance is always a plus. People are usually more often attacked in the city or town, and far more rarely in the wild. That doesn’t mean that you’re safer in the wild. It is often the case that those attacked often in the wild actually spend more time there. If you’re a regular hiker, you should consider defensive weapons your highest priority. Practicing beforehand and learning about the psychology of certain animals or reading about how to recognize if an individual is a potential threat (before explicitly attacking you) are obviously great additions to having good defense tools.